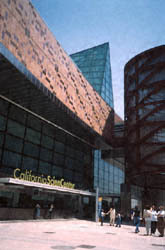 Begin your excursion into L.A.'s world of science in Exposition Park at the new California Science Center (http://www.casciencectr.org/) (700 State Dr., 213-744-7400). The museum uses high-tech, interactive exhibits to explore life processes and human innovation. The seven-story- high IMAX 3D Theater will take your movie-watching to unprecedented levels. 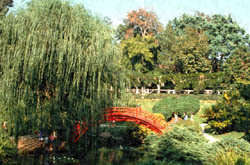 Slip into another world in the adjacent Exposition Park Rose Garden (701 State Dr., 213-748-4772). 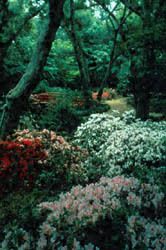 One of the largest rose gardens in California, the garden features more than 19,000 bushes. Fast-forward into the past at the Natural History Museum of Los Angeles County (http://www.nhm.org/) (900 Exposition Blvd., 213-763-3466). It's a mega-museum stuffed with treasures from pre-Columbian artifacts to dinosaur bones. 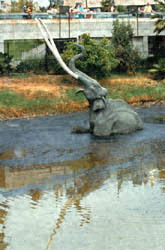 Drive to the George C. Page Museum and La Brea Tar Pits (http://www.tarpits.org) (5801 Wilshire Blvd., 323-934-PAGE), where you will find one of the world's richest Ice Age fossil sites. The museum illustrates life in L.A. during the Ice Age. Digs continue to the present day. 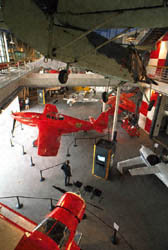 Located on the grounds of the Santa Monica municipal airport, the Museum of Flying (2772 Donald Douglas Loop North, Santa Monica; 310-392-8822) displays its extensive collection of aircraft and aviation memorabilia. 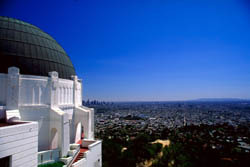 Trace the path of James Dean in the movie Rebel Without a Cause and head up to the Griffith Observatory (http://www.griffithobs.org/) (2800 East Observatory Rd., 323-664-1191). You'll get a breathtaking view of Los Angeles, as well as an educational look at the moon and stars through interactive exhibits. Also located within Griffith Park, head over to the 75-acre L.A. Zoo (http://www.lazoo.org/) (5333 Zoo Dr., 323-644-6400), where you can enjoy observing some of the most unique inhabitants of Los Angeles. Explore the Southwest Museum (http://www.southwestmuseum.org/) (234 Museum Dr., 323-221-2164), which offers exhibits and a research library that focus on the anthropology, archaeology and natural history of indigenous cultures. The Huntington Library, Art Collections and Botanical Gardens (http://www.huntington.org/index.html) (1151 Oxford Rd., San Marino; 626-405-2100) has 150 acres of beautifully maintained gardens and nearly 15,000 species of plants from all over the world. The most impressive is the Desert Garden, one of the largest research and display collections of cacti and other succulents. Descanso Gardens (http://www.descanso.com) (1418 Descanso Dr., La Canada; 818/952-4401) is a 165-acre retreat built in the 1930s. With a collection of more than 100,000 camellias, it also houses the Inter-national Rosarium, a five-acre educational garden that depicts the history of the rose. At the Arboretum of Los Angeles County (http://www.arboretum.org/) (301 N. Baldwin Ave., Arcadia; 626-821-3222), peacocks stroll among visitors to the 127-acre horticultural and botanical center. The Long Beach Aquarium of the Pacific (http://www.aquariumofpacific.org) (200 S. Shoreline Dr., 562-590-3100) is the United States' only aquarium devoted solely to the study of the Pacific Ocean. Its 550 species fill 17 major living exhibit tanks and 30 smaller tanks, and will take visitors on a journey throughout the Pacific's three regions: Southern California/Baja; the Tropical Pacific and the Northern Pacific. The Cabrillo Marine Aquarium (http://www.cabrilloaq.org/) (3720 Stephen White Dr., San Pedro; 310-548-7562) is organized around three major environments: rocky shores, sandy beaches and mud flats, and open ocean.